Postings have been slow of late because of moving into a new house. Regardless, we've been focused on taking advantage of the drop in the market. 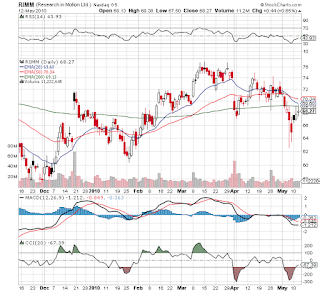 Yesterday, the Opportunistic Portfolio bought Massey Energy (MEE) and China Armco Metals (CNAM) and covered the short on Research in Motion (RIMM). Unfortunately besides a small short on RIMM, we missed reducing exposure on the drop, but we're confident that we picked up MEE and CNAM on the cheap yesterday. Last check that portfolio is up nearly 8% today. The basic theme was to buy what China needs and the met coal from MEE and the recycled steel from CNAM were the just the ideal options. It doesn't hurt that the stocks are down 40-60% from recent highs. Its become evident that China is going to protract any rate hikes due to the issues in Europe and hence the market is likely to flock back into the China theme which means more commodities. More on this subject later. Just amazed to see that a full 36% now and over 40% yesterday voted on this CNBC poll for the DOW to hit 5000 by year end. As they say, its difficult for something so drastic to happen if everybody predicts it. In a lot of ways, 2010 seems like the opposite of 2008. Everybody expects the Greece/Euro crisis to lead to Lehman II. The world is so different now. Asia and the US are now strong economies without the threat of a banking system collapse. In 2010, Europe has now pounced on the issue before it spread while the US waited too long thinking real estate was contained to sub-prime. The news of the ban on naked shorting in Germany yesterday likewise drew comparisons to the ban on shorting in the US in Sept 2008. Again, similar sounding situations but likely different outcomes. Germany is no US and naked shorting should be banned. Interesting comments by a UTEP professor regarding the BP oil spill in the Gulf of Mexico. First I've really heard about the natural seepage of oil into the worlds oceans that tiny microbs eat on a regular basis. Not that I'm any where close to an expert on oil spills, but it was non the less interesting to hear from an expert that this spill isn't the catastrophe that all claim endlessly on the news channels. It might also explain why we've yet to see much damage or impact from the oil spill other then relents fear from the media. Fast Money on CNBC can be one of the best sentiment indicators among traders on TV. Having 4 traders on at the same time provides a good, quick look at the current sentiment. 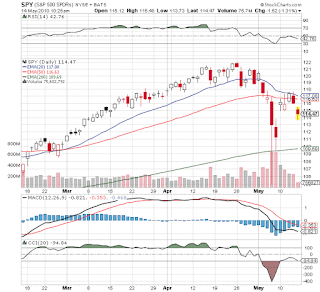 Anytime they are all this bearish after a huge decline in the market, its a good sign to take the other trade. The low of the day wasn't too far from this shows airing.... hmmm! Watch the last minute if you want to just see the negative predictions. The market seems to do what it has to do and it'll always find headlines to justify the move. Today we've had nothing but supposedly negative news from Europe. Anybody find anything actually negative? Please something more then a few snippets from an old Fed President is needed. More likely the scenario is that Mondays open created a gap in the SP500 that the market just can't stand to leave open. You won't see it on the $SPX on the market because of the sloppy open where numerous stocks are delayed several minutes before opening. The SPY though captured it. With the swoosh at the open today, that gap has been filled and in fact created another one on the opening today. The market has bounced nicely off the $113.5 level and must eventually fill the gap back up to $116 now. That will also be where it meets the 20/50ema likely for the ultimate test of whether this market is heading back up to old highs at $122 or back into the bear market abyss. Shorted Research in Motion (RIMM) for the Covestor - Opportunistic Portfolio as its becoming more and more apparent that they are becoming a laggard in the smart phone wars. Or at least that's the perception in the markets. With their failure to break the 200EMA just above $69, took the opportunity to short them and hedge alot of my long exposure. On a valuation basis, RIMM isn't overly expensive trading at roughly 13x 2011 estimates. Just have to wonder if RIMM will meet those estimates considering the success of the iPhone and Android products. 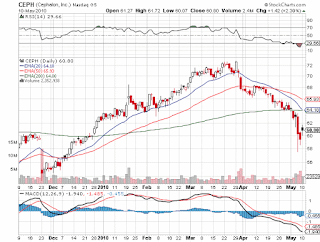 Our Growth and Opportunistic Portfolios purchased Cephalon (CEPH) last week during the downturn. Ockham Research has a good summary of the Q1 report. This basically sums up our investment thesis as well so we won't repeat it here. The company guided towards $7-7.20 for 2010 yet the market continued to sell the stock down into the upper $50s or below 9x guidance. Its interesting that the current highest estimate is only $6.98. Analysts apparently doubt the guidance. Though trading below the 200EMA is concerning from a technical basis. Today's weak bounce means the stock is likely to lag any rebound in the market. If it doesn't hold, we made trade it for a lower entry. The value thesis just becomes more attractive at lower prices. 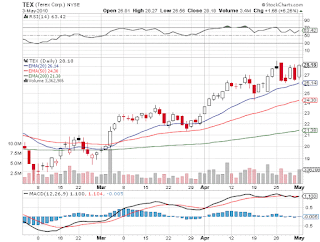 AerCap Holdings (AER) reported strong results before the market opened on Friday. Naturally with panic regarding Greece, they went widely unnoticed. In fact the stock continued its massive decline as investors feared contagion dampening the key European market. AER remains the largest holding in the Growth Portfolio and returned to that title in the Opportunistic Portfolio as we added shares around $11.4 on Friday on the swoon. Could contagion spread causing a Eurozone collapse...Yes... Will it happen... Unlikely. Greece is a completely different animal compared to the other PIIGS and very likely a one-off situation. AER has direct exposure of 2 planes to one customer in Greece. Some comments from the Earnings Conference Call from the CEO. Listen from roughly around the 23 minute point (or 4:30 of the Q&A section) and listen to the response regarding the Greece contagion fears. Well, clearly stronger then the market thinks based on the markets last week. People still don't seem to understand that Greece had fraudulent government deficit reports and a economy in decline that is creating its need for a bailout. Other European countries like Spain and Portugal are recovering and though they face numerous issues they aren't nearly as bad off as Greece. Don't take my word on it though. Listen to the Chief Economist of JPMorgan (JPM). It actually surprised me that Europe as a whole is doing this good. PMI in the mid 50s and economic growth in the 2-4% range. Also don't forget that a lower Euro helps the export sector. After a decade of extreme negativity for tech stocks, it shouldn't be that surprising that some stocks in the sector have PE multiples unheard of for the sector. After a decade where a typical tech stock fell some 90% from their 2000 peaks, why would investors pile into them regardless of their earnings? After all, why not buy commodity and energy stocks that have been all the craze for the last 5 years. Not something we'd usually comment on, but the option volume sure suggests something is in the works. TEX closed at $28.18 which is close to a 52 week high. The spectacular number today is the 15K options traded for May with a large volume in the 30s. This does give some credance to the rumors of management taking them private via a LBO. TEX has been rumored of a buyout for a while now. They've cleaned up their business via some divestures that has really solidified the balance sheet. The stock trades nearly 70% below its 2007 high and management expects earnings of $6 in 2013. Means making $7-8/share is the likely internal goal. Why wouldn't you want to take it private if the market will let you? At least that's the number that First Trust quotes from the ISM. The ISM came in at a strong 60.4 which was barely above expectations, but its key to not get caught up in the expectations game sometimes and just absorb the numbers. A number above 60 represents exceptional growth and was last seen in 2004. It wouldn't surprise us to see this number move on into the mid-60s before peaking out. Especially with new orders rising to 65.7 signaling strong growth ahead. Read the report from First Trust for all the details. The 6% GDP growth is something that the market clearly does not have factored into estimates. Not sure I've heard any other economists forecast such high numbers.